Your kidneys remove waste and excess water from your blood, releasing them as urine. When your kidneys don't work properly, this process is affected and kidney disorders may be a result. Some forms of peppermint are not recommended for people with certain kidney disorders, but may be beneficial for others. 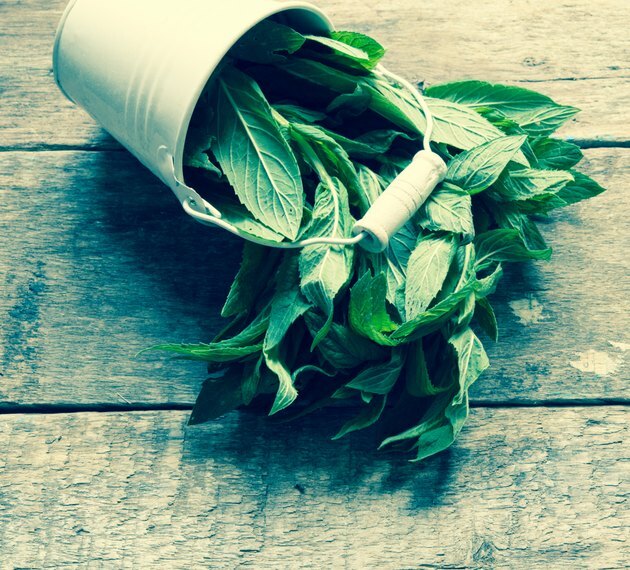 Talk to your doctor before using peppermint to treat kidney problems or any medical condition. Peppermint is a plant that is native to Europe and Asia, but is cultivated worldwide for many medicinal purposes. The plant contains menthol, which is an oil that appears in some foods and perfumed cosmetics. Peppermint calms stomach muscles and aids in bile production, according to the University of Maryland Medical Center, and is the most common use for the herb. However, it also has antibacterial properties, which makes it a good choice for controlling bacteria in your kidneys, keeping them healthy and functioning properly, according to the Baseline of Health Foundation. Kidney stones are a common issue involving the organ and produce pain in the back and stomach, nausea, vomiting, pink or red urine and pain when urinating. MayoClinic.com recommends drinking tea to treat and prevent kidney stones. Keeping your fluid levels up is important for ridding your kidneys of stones, making tea a good option. However, the journal "Phytotherapy Research" recommends avoiding peppermint oil if you have kidney stones. Peppermint is also a way to keep your kidneys clean, helping reduce the risk of kidney disease by ensuring that the filtering devices, called nephrons, in your kidneys work efficiently to remove waste and water. Peppermint tea is considered safe even in large doses, according to the University of Maryland Medical Center. Steep the tea according to package directions and drink it regularly if you are prone to kidney stones. If you prefer to use peppermint oil or peppermint capsules for your kidneys, the recommended dose is 0.2 milliliters two to three times per day. Despite its potential benefits, peppermint is an herb that is not regulated by the U.S. Food and Drug Administration. Some people may experience allergic reactions or burning with use. Peppermint shouldn't replace any prescribed medications or treatments for your kidneys and requires a doctor's advice and supervision. The herb can interfere with some medications, including those that support an organ transplant, treat diabetes and control blood pressure. It may also cause adverse reactions when combined with other herbs. Talk with your doctor about the appropriateness of using peppermint to treat your kidney disorder. Does Peppermint Oil Help to Relieve Constipation? Does Green Tea Damage the Kidneys?